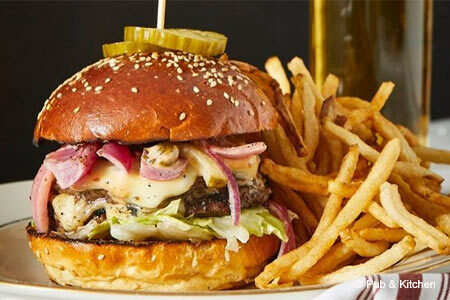 : Center City’s Pub & Kitchen is much more than the sum of its titular parts. It would be easy to dismiss the corner space on Lombard Street with its definitively bar-like atmosphere and dark wood interior as a burger-and-beer joint. Yet the food, courtesy of chef Eli Collins, is among the most exciting in the city. Yes, the burger served with Cooper sharp cheese is first-rate, but so are the seasonally changing entrées like rabbit meatballs over polenta and smoky grilled trout on green lentils with carrots and roasted sunchokes. With its mix of textures, the Chop Chop with pumpkin seed hummus, crispy socca and pickled vegetables redefines what a salad can be. Brunchtime is given equal attention with homemade sausage patties, a frittata with bluefish pâté and a killer Bloody Mary (here called the Wrangler). As for the pub component, the cocktail list focuses on classics like the Moscow Mule and has innovative spins on the Manhattan (including mezcal) and the Bees Knees (with tequila). The wine list is edited down to 12 selections, all available by the glass or bottle, and the bar keeps an interesting mix of domestic and international craft beers and ciders on draft. The happy hour special offers $7 cocktails, $5 wine and half-priced oysters.